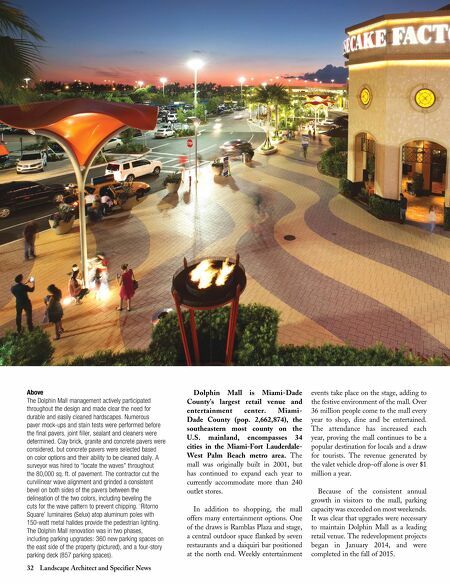 February 2016 33 Project Design The redevelopment projects included construction of two new surface parking lots; a four-story parking deck; five new restaurants; outdoor dining areas; a restaurant promenade with a second valet drop-off area; and completely renovating Ramblas Plaza. 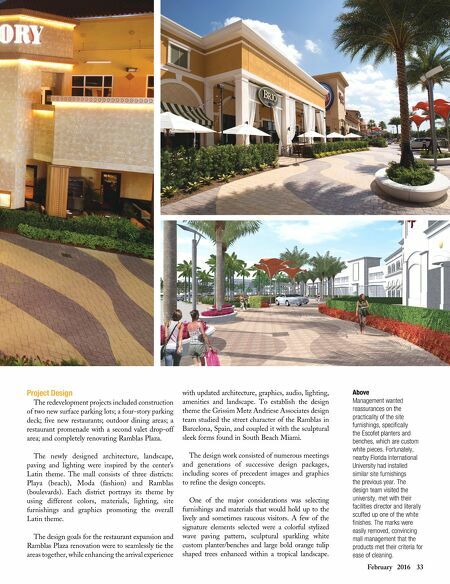 The newly designed architecture, landscape, paving and lighting were inspired by the center's Latin theme. The mall consists of three districts: Playa (beach), Moda (fashion) and Ramblas (boulevards). Each district portrays its theme by using different colors, materials, lighting, site furnishings and graphics promoting the overall Latin theme. The design goals for the restaurant expansion and Ramblas Plaza renovation were to seamlessly tie the areas together, while enhancing the arrival experience with updated architecture, graphics, audio, lighting, amenities and landscape. To establish the design theme the Grissim Metz Andriese Associates design team studied the street character of the Ramblas in Barcelona, Spain, and coupled it with the sculptural sleek forms found in South Beach Miami. The design work consisted of numerous meetings and generations of successive design packages, including scores of precedent images and graphics to refine the design concepts. One of the major considerations was selecting furnishings and materials that would hold up to the lively and sometimes raucous visitors. A few of the signature elements selected were a colorful stylized wave paving pattern, sculptural sparkling white custom planter/benches and large bold orange tulip shaped trees enhanced within a tropical landscape. Above Management wanted reassurances on the practicality of the site furnishings, specifically the Escofet planters and benches, which are custom white pieces. Fortunately, nearby Florida International University had installed similar site furnishings the previous year. The design team visited the university, met with their facilities director and literally scuffed up one of the white finishes. The marks were easily removed, convincing mall management that the products met their criteria for ease of cleaning.